How many quarters would you spend on it? There was a time when the only micro-transactions in gaming were spent on continues, explicitly with quarters, each time you lost all your lives in an arcade game. Back then, Capcom's arcade division was hugely profitable, much more so than their console or mobile game outings are today. Their explicit mastery of producing state-of-the-art 2D sprite-based graphics and engineering game mechanics that compelled players to plunk more quarters-per-minute put them in a league of their own. Some records state that Street Fighter 2 made an estimated +2 billion dollars in arcades by the end of 1995, and's just one game. While competitive fighting games were by far their most profitable outings, cooperative multi-player beat 'em ups came in a close second. By allowing four, five, or even six people to play at once, publishers could make four, five, or six times as much money in the same amount of time. 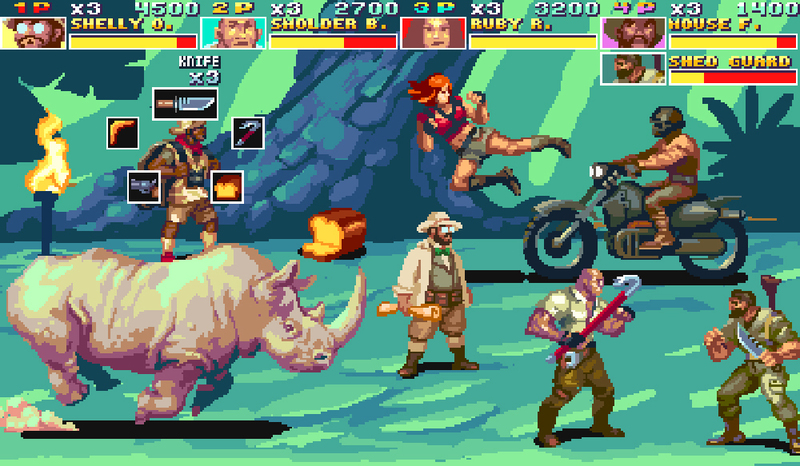 That's why I'm sure this theoretical Jumanji: Welcome to the Jungle beat 'em up, crafted in the style of Capcom classics like Dungeons and Dragons: Shadows Over Mystara and Cadillacs and Dinosaurs would be insanely profitable, regardless of when it was released. Sure, it would undoubtedly have made the most money if it were put out in arcades back in the 90s, but I think it could still do well today if released on Steam and consoles. Artist Castpixel put a lot of thought and emotion into producing this fan art. 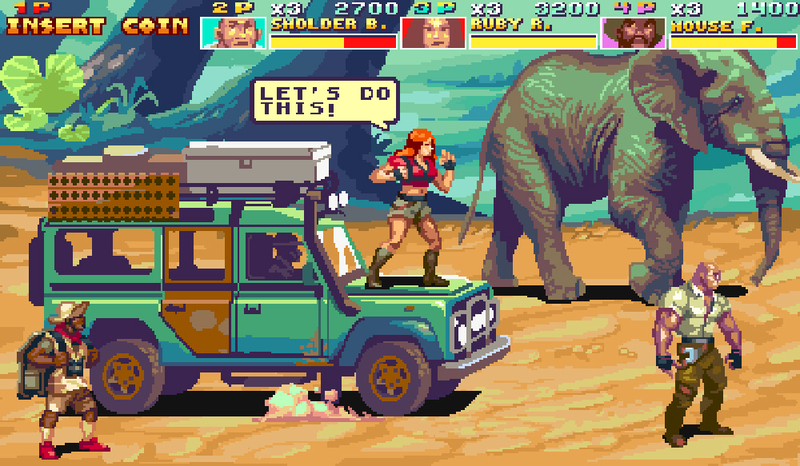 After seeing a scene in the new Jumanji where lead character Martha performs an attack that's a near-perfect recreation of Tyris Flare's jump kick from Golden Axe, her imagination ran away from her. A couple of days later, she'd planned out her dream Jumanji game from top to bottom, making sure to keep everything from wardrobe to land rovers as accurate to the film as possible. That loyalty to the source material would carry over to gameplay as well. She told us that [mild spoilers] "Mouse Finbar's game power is amazing, he can produce items for everyone to use, It would be rationed between stages, of course, but still cool. He can also produce cake, but can't consume it because he explodes (according to the movie)." I haven't even seen the movie yet, and I'm already sold. 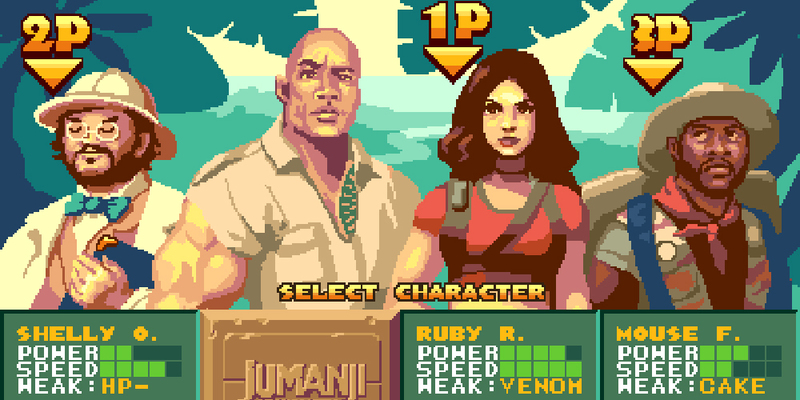 Seeing that Jumanji: Welcome to the Jungle is the reigning box office champ at the moment, it seems like green lighting a game adaptation (perhaps in time for the upcoming DVD/Blue-ray release?) would make good business sense. It worked for The Mummy Demastered, and that was an adaptation of a film that bombed hard. Just imagine how many quarters a game like this based on film that was actually successful could make?